December 2014 n Performance & Hotrod Business n 41 PHB: How did you end up in the position you have today? TG: I worked many years as a flat-rate mechanic at various places, including Ford dealerships, Firestone and Pep Boys. I also worked in Steamboat Springs, Colorado, as a snowcat mechanic at a variety of indepen- dent shops. I always wanted my own place where I could be immersed in the cool part of the automotive industry—hot rods. When the time was right, I made a move and started Streamline back in 1997. It started out as a build shop and slowly moved into a retail parts outlet. The need for parts in the area expanded rapidly, and I began to rework my plans that included a strict focus on parts, with the goal of a worldwide distribution business. It became apparent to me that manu- facturing and supporting our own prod- ucts was an essential transition. As we grew, I eventually purchased Gennie Shifter in 2002. A great name and even better product! PHB: Tell us about your company and its place in the performance aftermarket. 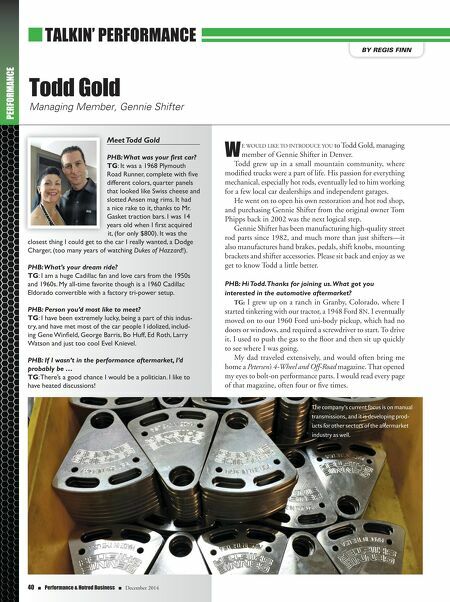 TG: Gennie Shifter focuses on shifters, pedals and cables, and has been an innova- tor in the hot rod market since 1982. Since grabbing the reigns in 2002, all manufac- turing was brought in-house. Our quality is second to none, with our shifter sticks now made of stainless steel and all parts that were welded are now hogged out of a solid piece of material. 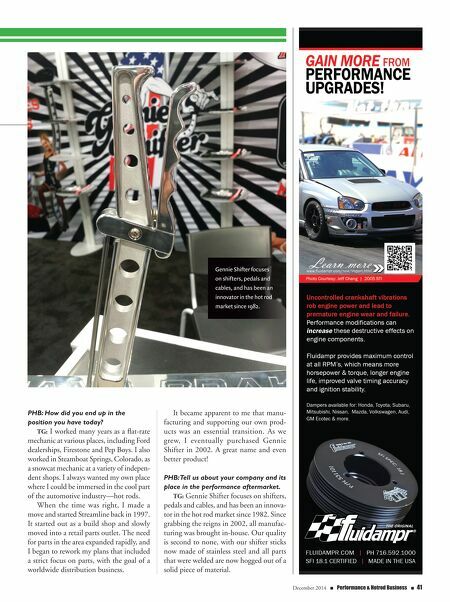 Gennie Shifter focuses on shifters, pedals and cables, and has been an innovator in the hot rod market since 1982.